A popular polymer-based solar cell could produce more energy if the electronic charges can move efficiently through the cell's components. A novel three-component mixture allows conductive solar cell materials to self-align into columns. The alignment improves the efficiency. This, in turn, allows the solar cells to be fabricated more than three times thicker without degrading the high performance. The greater depth makes the process more compatible with conventional industrial coating processes. Reliable manufacturing. High performance. The internal architectures formed by this new blend of three components has potential to make these materials more amenable to reliable manufacturing. The devices can be made at greater thicknesses. These depths are better suited for conventional industrial coating processes but still allow the cell to maintain its high performance. Low-cost, large-area scalability by solution processing is an important advantage of organic polymer solar cells. Typical organic solar cells, however, require active layer thicknesses of less than 100 nanometers (about 0.000004 inches) for optimal performance, due to the limitations of polymer semiconductor charge carrier mobility. This presents a significant challenge for solution-based manufacturing—large-area coating technologies (for example, roll-to-roll or slot-die coatings) are unable to provide reliable films at such thin dimensions. 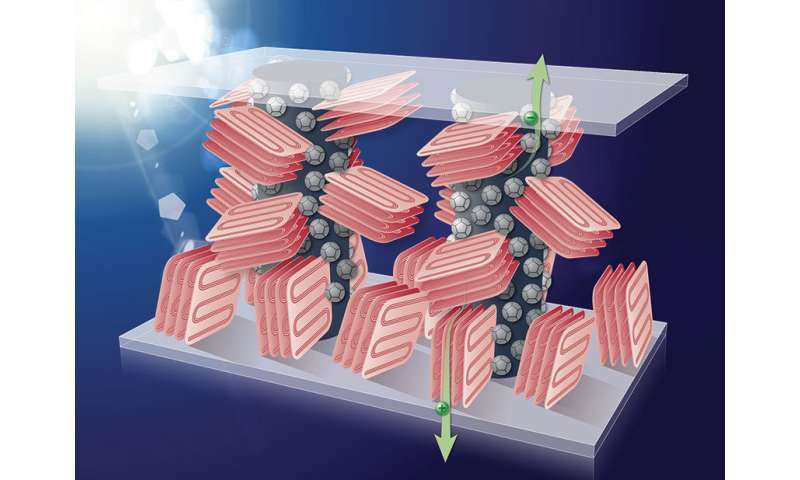 The Center for Nanoscale Materials and Stony Brook University team demonstrated that adding a third polymer component to the binary blend of organic solar cell materials leads to a self-assembled columnar nanostructure. This enhanced the charge mobility and photovoltaic performance in devices with layer thicknesses of more than 300 nanometers—more than three times thicker than typical. Detailed experimental studies and simulations reveal that interfacial tension between the polymeric components is crucial for obtaining the self-assembled columnar nanoarchitecture that provides efficient charge extraction pathways. Practically, this ternary blend organic solar cell architecture has potential to enable reliable large-area manufacturing because the devices can be made thicker for conventional industrial coating processes.